Apple's iPhone SE Makes Another Appearance in the Apple Clearance Store, Starting at $249 - Get it While You Can! Apple’s iPhone SE Makes Another Appearance in the Apple Clearance Store, Starting at $249 – Get it While You Can! If you missed your chance to grab a deal on Apple’s iPhone SE a few days ago when it was available in Apple’s online clearance store, you’ll be glad to know that it is available once again. For how long, no one knows. 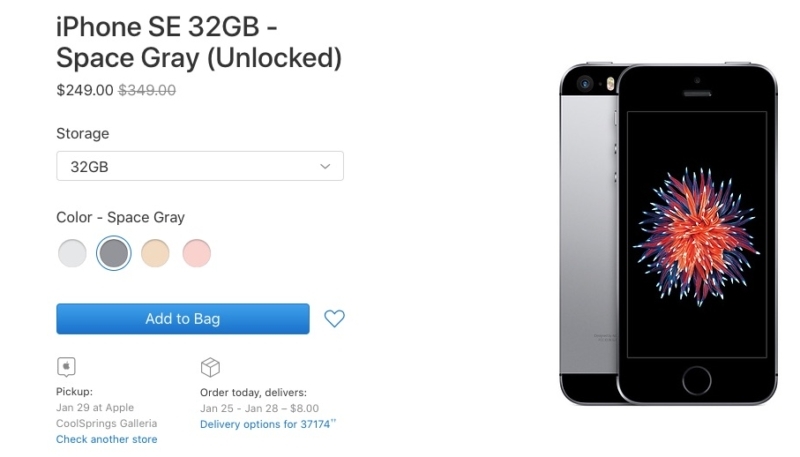 Apple is offering the iPhone SE with 32GB of storage for $249 and with 128GB of storage for $299 on its clearance store in the United States. These are brand new, unopened, and unlocked models with unchanged tech specs, including a 4-inch Retina display, A9 chip, Touch ID, and 12-megapixel rear camera. Prior to being pulled, the iPhone SE was available with 32GB and 128GB of storage for $349 and $449 respectively, so Apple is offering $100 to $150 off. The device was originally released in March 2016 and was popular among fans of smaller smartphones and those who preferred the iPhone 5-like design. It’s uncertain how long these will last, but the last time they appeared in the clearance store, they were gone in a matter of hours. So, high-tail it over to the store now if you’re in the mood for a little bit of iPhone SE goodness.